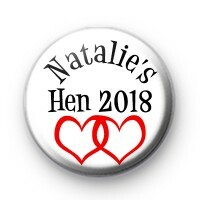 Red Heart Hen Party Badges. Cute love heart themed Hen Night Button badges. Bride, Bridesmaid, 25mm pin badges.